When you think of an accessible design, what comes to mind? Handrails in the bathroom, wider doorways, or perhaps a countertop or sink constructed at a suitable height? While these practical considerations certainly play a role, an accessible design can be about more than just the practical side. This recent fully accessible kitchen design in Warminster, PA completed by the team at Lang’s Kitchen & Bath, was created to meet the accessibility, lifestyle, and décor requirements of this family. 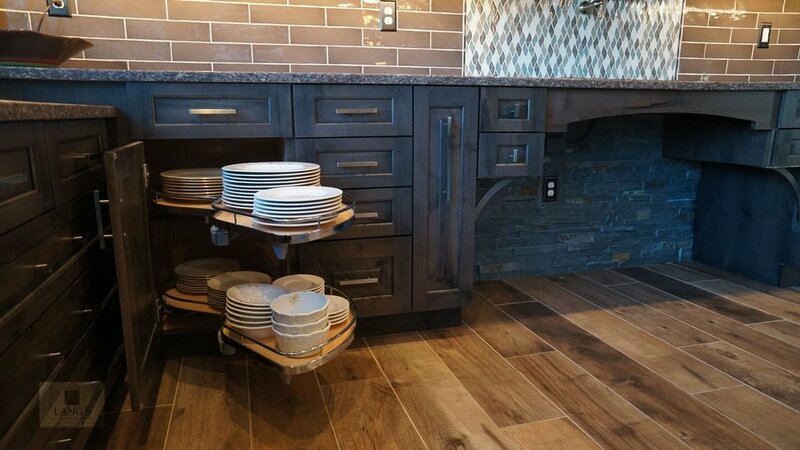 The result is a wheelchair accessible kitchen for an avid home chef, that is also a stunning, rustic style kitchen design packed with amazing features that serves as a design centerpiece in this home. Why focus on an accessible kitchen design? You may require an accessible design if you or a family member uses a wheelchair or is mobility impaired, or in some cases if you plan to age in place in your current home. Your kitchen design features may vary depending on the level of accessibility required, as well as who else will be using the kitchen. If you believe an accessible kitchen design is right for you home, your kitchen remodeling expert will help you find the right solution, and in some cases, you may want to also work with an occupational therapist in the planning stages. The key to getting a kitchen design that works for you is to plan for what you need now, plan for the requirements of all household members who will use the space, and plan how your needs may change in the future. What are the key elements in creating an accessible kitchen design? Kitchen layouts are typically designed around work zones, and an accessible kitchen design is no exception. The first step is to create work areas at a suitable height and with appropriate accessibility to meet your needs. If you are designing for wheelchair access, this may mean installing a lower countertop and sink that is open underneath to allow easy access to the work space. Add pull-out storage next to the sink area to keep your cleaning supplies handy. For aging in place, consider countertops with a rounded edge instead of corners, to avoid hitting against any sharp edges. Similarly, consider the items that you will need to access on a regular basis in your kitchen and make sure all essential storage is easily and safely accessible. There are several ways to accomplish this. First, focus on base cabinet storage with handy, customized pull-outs, drawers, and roll-out shelves like the ones shown below. These design accessories are perfect for any kitchen design and all kitchen users, but they make access to dishes, food items, and cooking tools even easier if you are mobility impaired. There are also ways to access upper kitchen cabinet storage, including pull down shelves or even electric-controlled cabinets or shelves that can be lowered at the touch of a button. Consider including a wheeled trolley or standalone cabinet unit that you can use to easily transport supplies and meals between the cooking and eating areas. Just like with counters and sinks, make sure your range, oven, and other appliances are positioned so you can easily access them. Adjust the height of wall-mounted ovens or include an under-counter oven that you can easily open, install a range that is open underneath and therefore wheelchair accessible, and add an undercounter microwave. Dishwasher drawers may be easier to access than standard dishwashers. Similarly, refrigerator drawers, undercounter refrigerators, or side-by-side opening refrigerators allow easier access to all items. If possible, visit a showroom to try out different styles of appliances to see what works best for you. A design geared around mobility issues must ensure that there is ample clearance to get through doorways, hallways, and in and out of rooms. Similarly, your kitchen layout must allow for ample space to maneuver in and out of kitchen work zones, around the island and dining table, and to access storage areas. An open plan kitchen design, popular for its airy spaces and open access between kitchen, dining, and entertaining areas, is also well-suited to an accessible kitchen design. Speaking of the floor, make sure to select a floor surface that is low-maintenance and slip-resistant, which is especially important when aging in place in your home. Make life less complicated by selecting hardware and accessories that are accessible and easier to maneuver. Handles tend to be less demanding to grip than knobs for example, and single lever action or even touch-control faucets simplify washing food, hands, and dishes. This can help when your grip is not as effective, for example for older members of the household. Consider your placement of electrical outlets and lighting controls, as well as other appliance controls to make them readily accessible. An experienced kitchen design professional will be able to advise you on ADA-guidelines, best practices for designing a kitchen for various levels of mobility, and the latest products that meet your needs. At Lang’s Kitchen & Bath we are experienced in accessible kitchen design, bathroom design, and other home remodeling. Visit our kitchen design gallery or contact us today on 215-968-5300.